As a teacher, scholar, researcher and clinician, Dr. Nigg helps advance our understanding of attention-deficit/hyperactivity disorder (ADHD) and related conditions. While his primary focus is on cognitive, neuropsychological and emotional mechanisms involved in ADHD, his interest in “how and why” has led him to research environmental conditions. 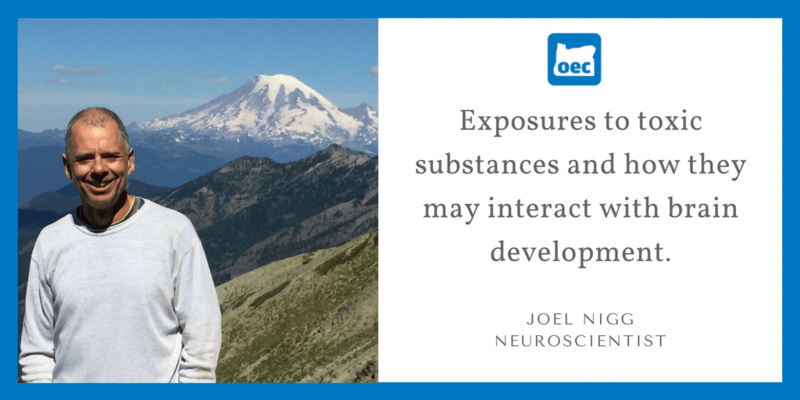 These include exposures to toxic substances and how they may interact with genes and other factors in brain development and in child neurodevelopmental disorders. Dr. Nigg also volunteers his time and expertise as a board member and advisor to Oregon Environmental Council and Oregon Physicians for Social Responsibility as well as the Union of Concerned Scientists National Scientific Advisory Board. Scientists tend to be very cautious; they know that nothing is ever totally certain because new data are possible—this is true not only in science but in every area of life. Some people interpret this caution as “we don’t know” and, therefore, they want to ignore what science has to say. But nothing could be further from the truth. Science delivers information with an actionable level of confidence, well beyond what we have from other sources. Science is the best source we have for deciding what course of action is most likely to be correct. 1 Reply to "OEC Celebrates Scientists: Joel Nigg, Neuroscientist"